This article is the first of a three-part series, featuring an exclusive interview with Victor V. Shalaj and Valery I. Trushlyakov, reporting their research on space safety and sustainability. Manufacturing site’s Cosmos 3M in Omsk (Credits: Polyot). Omsk, a large city in eastern Siberia, is perhaps one of the most significant places in the world to talk about sustainability and space debris. 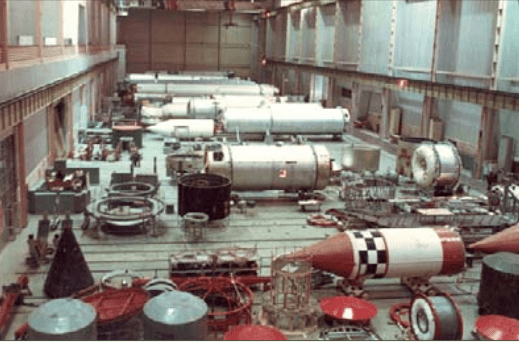 In 1969 the Omsk Polyot (ПО «Полёт) manufacturing site started the mass production of the Cosmos 3M, building about 420 rockets before production stopped in 2006. Cosmos 3M, or SL-8 as it was designed by the US Department of Defense, is well known among space debris experts because its upper stage represents one of the major threats to the sun synchronous low Earth orbit with more than 300 debris objects still orbiting around Earth at different altitudes (700-1500 km). As of 2007, launch frequency of the rocket was reduced out of concern from the toxic propellant used; the last confirmed launch was in 2010. I travelled to Omsk for the 70th anniversary of Omsk State Technical University (OmGTU). OmGTU is one of the most important research centers in eastern Siberia with many international connections. There I met two pioneers of launcher sustainability: Victor V. Shalaj and Valery I. Trushlyakov. At that time, Russian rocket development was directed mainly towards building reliable and safe launchers. Concepts like ecology and sustainability were far from becoming the priority they were at the turn of the century. However, in the early 80’s Polyot started a deep modernization of Cosmos-3M. It would have consisted in the replacement of the control system as well as significant reduction of unused toxic residues in the fuel tank of the 1st stage. The research conducted by Professor Trushlyakov, who has worked for 23 years in the design bureau of Polyot, was cut when it was defunded because of Perestroika. Only after the revolution in 1989 and the breakup of the USSR, did sustainability became a primary topic in the Russian space agenda. Unsustainable practices became more costly as Russia, now in a different country from Baikonur, its primary Kazakh launch site, began paying very high rent to compensate Kazakhstan for contaminating their land with toxic propellants such as RP-1 and UDMH. Shalaj and Trushlyakov worked to solve this problem in 1989. They developed a revolutionary system for reducing the environmental impact of rockets: the gasification of the residual propellant. Designed to be installed on a Proton rocket, the system consisted of the insertion of an inert hot gas in the tank of the rocket to gasify the remnant propellant. The option was not implemented in the end, and nowadays the Proton 1st stage dumps its residual propellant in the air after the burn out and before falling to the ground. However, Shalaj and Trushlyakov didn’t abandon the project, convinced that the gasification idea could have a place in the future because of its dual merit: reducing environmental harm as well as narrowing the possible drop zone of rockets’ 1st and 2nd stages. Check back for the second article in this series that explores the unexpected usefulness of residual propellent.